Chess was invented in India, and the country is home to 32 active grandmasters including world no. 5 Viswanathan Anand. Algorithms: Blind Chess Players of India focuses on three young men who hope to follow in his illustrious footsteps, notwithstanding the fact that they must rely on touch and memory rather than sight to play the game. The three boys featured in Algorithms come from varied backgrounds. Darpan Inani, 15 years old, lost his sight following a bout of Stevens-Johnson syndrome. Despite this, he became the best blind chess player in India while also following a strict schedule of schoolwork and exercise. While Darpan’s family strongly supports his efforts in chess, Anant Kumar Nayak comes from a poor family who can’t provide him with the same resources, and his parents are not entirely sure he should be spending his time on a game rather than studying. Sai Krishna, at 12 the youngest of the boys, is also the only one of the three to retain any vision. He’s talented but takes his losses hard, although he’s still enough of a kid to enjoy playing with an electric door when his matches are done. The young players may be the focus of the film, but its workhorse is Charudatta Jadhav, who lost his sight as a teenager but continued to play chess. After winning several national championships and captaining the Indian national chess team, he retired and took up a career as an IT professional, but continues to devote hours to his mission as an evangelist for blind chess. He tells his young players that “chess is the only game where a blind player can play at par with sighted” and provides them with technical coaching, encouragement, and tough love. Make no mistake, though—he really wants to win, and is less concerned about which player is most successful as long as one of them wins a medal at the world championships. Algorithms may sound like Brooklyn Castle in India, but it’s really more of an art film, beginning with the director Ian McDonald’s choice to shoot in black and white, the traditional colors used for chess pieces. 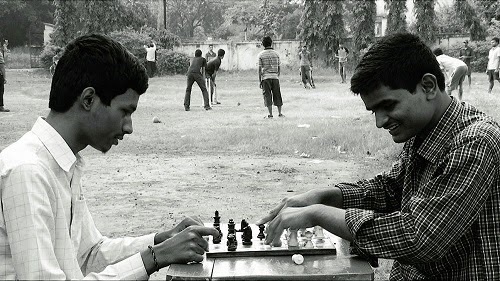 Although there are many shots of the players practicing and in competition (they “see” the board positions by touching the pieces, so the black squares are raised and the black pieces have a point on top), the film’s focus is not on the outcome of any particular event so much as on the texture of life in and around the events, from cricket matches on a playground to casual conversations between the players. If you’re looking for a conventional sports melodrama, Algorithms may not be the film for you, because it doesn’t provide the conventional signposts and tugging of the heartstrings familiar we’ve been trained to expect from films like Undefeated. However, if you’re up for something different, that offers a view into a world that you may not have even realized existed, then it’s definitely worth your while.